As part of an extensive renovation project, first-time developer Lee Kent chose a manual gas stove by Valor to help to bring a derelict cottage in Staffordshire back to life. Located in Winshill, Staffordshire, the property was purchased by Lee in 2017 and was cold, damp and had been in a state of disrepair for some years. Keen to restore the run-down mid-terrace cottage back to its former glory, Lee embarked on a major refurbishment programme which saw the two-bedroom property stripped back to the brick, damp-proofed and re-plastered. A new kitchen and bathroom were also installed and the cottage was redecorated throughout. Like many old cottages, the property featured an out-dated heating system, including an inefficient gas fire in the living room, embedded in a false fireplace. Looking to modernise the property whilst making the most of its original features, Lee decided to knock through the false fireplace and create a striking focal point more in keeping with the cottage’s rustic charm. After initially considering a solid fuel stove, Lee was put off by the high product and installation costs, compounded by maintenance requirements, and began looking for more cost-effective alternatives. 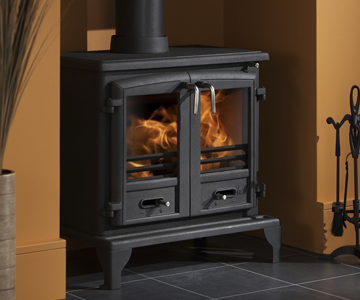 Lee opted for the Valor Ridlington gas stove; a traditionally-styled gas fire stove with enhanced control features. Available with manual or remote control option with a choice of coal or log fuel effect, the gas fire offers variable heat settings, including a 4.7kW heat output with 77% efficiency. As a lower maintenance, more efficient alternative to solid fuel stoves, the Valor Ridlington combines all the charm and atmosphere of a real fire with a realistic flame picture and glow. Indeed, compared to solid fuel stoves, it comes with greater control, eliminates the need to purchase and store fuel or clean out after use. It also takes away the hassle of complying with DEFRA’s smoke control areas, which puts restrictions on what can be burned. With its matt-black finish making it a stylish addition to any room, the Ridlington’s tasteful design meant Lee didn’t have to compromise on aesthetic appeal. He said: “As the focal point of the living room, it was important to find a heating solution that would not look out of place in a traditional cottage – and the style was exactly what I was looking for.